A new study reveals that the progressive loss of lung function in asthma sufferers could be entirely independent of the effects of inflammation. The findings have significant implications for the long-term treatment of asthma. The MRC-funded researchers were from the University of Southampton. The research, which is published in the New England Journal of Medicine, challenges the traditional concept that asthma is solely an inflammatory condition. 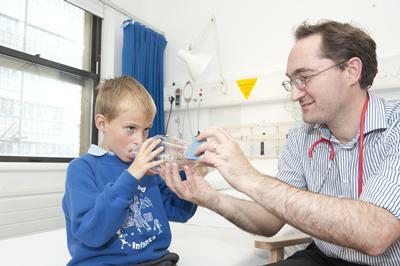 Dr Peter Howarth, a senior author on the paper from the University of Southampton, says: “Whilst reducing airway inflammation by inhaling steroids, the traditional treatment for asthma, is very effective for most patients, this does not address the long-term airway wall thickening and scarring that takes place in the lungs of individuals with asthma. Known as ‘airway remodelling’, this can irreversibly affect lung function. Researching on 48 asthma suffering volunteers, the team analysed lung airway remodelling by looking at airway samples (bronchial biopsies) taken from the volunteers before and several days after they underwent breathing tests. To test whether remodelling was caused by inflammation, the participants were split into four groups. One group had airway narrowing and inflammation temporarily induced, one had just airway narrowing but no inflammation induced, and two control groups had no airway narrowing induced at all. The team found no significant difference in airway remodelling between the first two groups, which led them to their conclusions. ‘Effect of Bronchoconstriction on Airway Remodeling in Asthma’ by C. Grainge, L. Lau, J. Ward, V. Dulay, G. Lahiff, S. Wilson, S. Holgate, D. Davies and P. Howarth will appear in the May 26, 2011 issue of the New England Journal of Medicine (NEJM). Listen to Dr Peter Howarth being interviewed by John Humphrys on BBC Radio 4's Today programme.